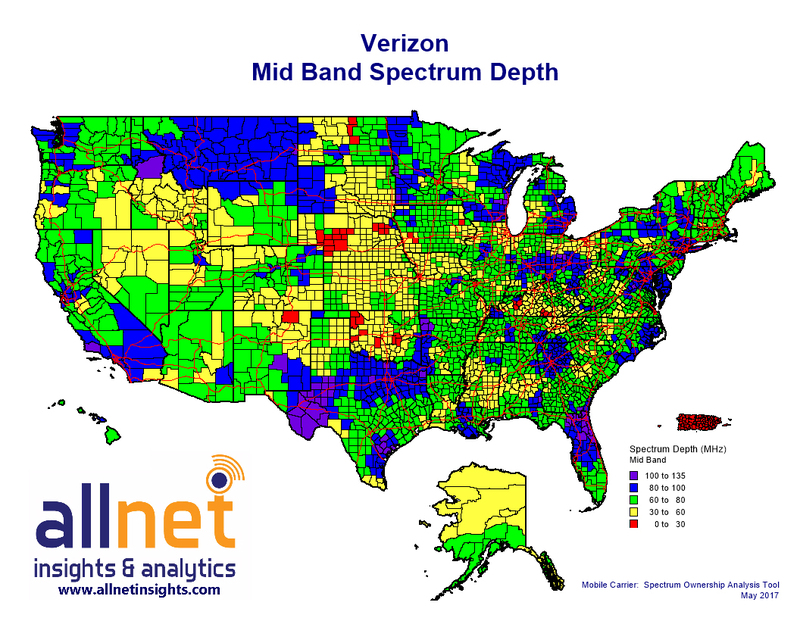 In 2017, how much low-, mid- and high-band spectrum do Verizon, AT&T, T-Mobile, Sprint and Dish own, and where? 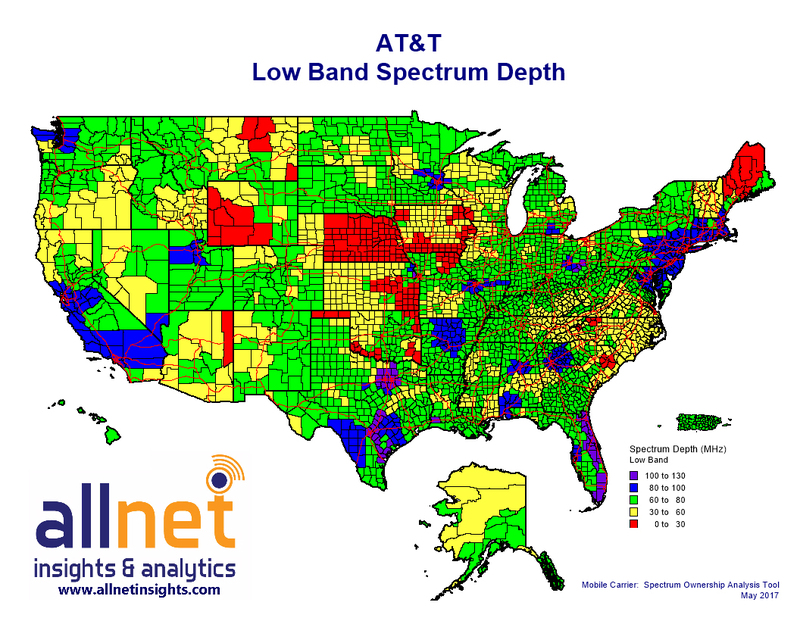 Licensed spectrum remains perhaps the most important building block in the wireless industry. 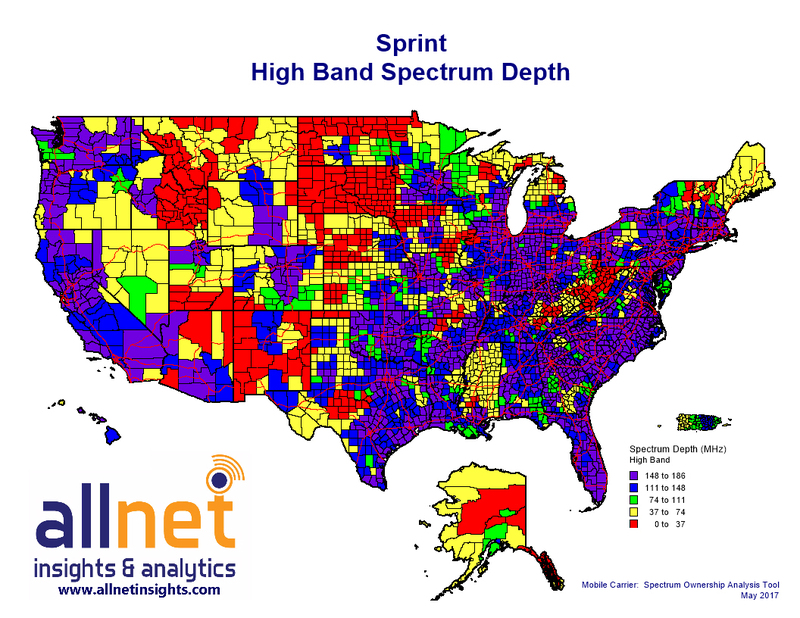 As a result, nationwide carriers like Verizon, AT&T, T-Mobile and Sprint are eager to both obtain suitable spectrum holdings across the country, and to use those spectrum licenses in the most effective way possible. But where exactly do these nationwide carriers own spectrum? And what type of spectrum do they own? And how much? 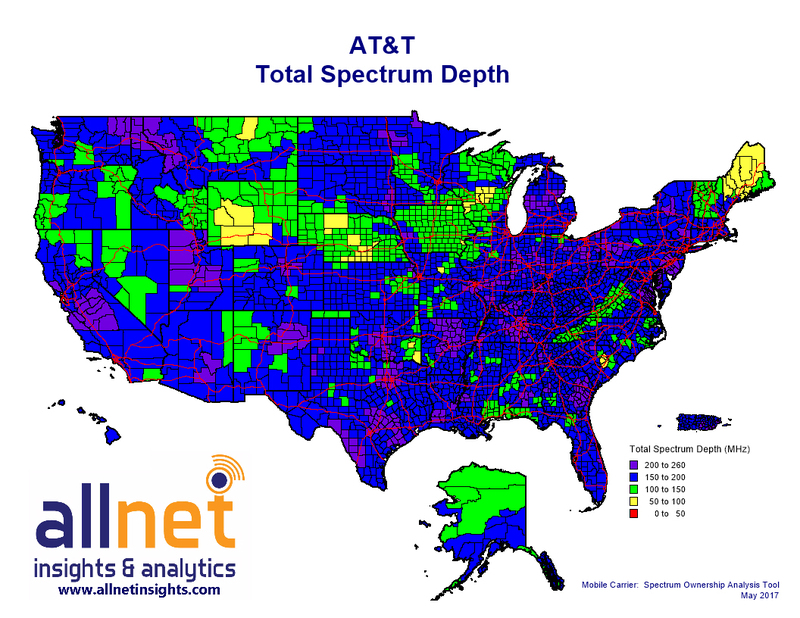 To answer these questions, FierceWireless has once again partnered with Allnet Insights & Analytics, a wireless spectrum research and analysis firm, to map out exactly how much spectrum each of the four Tier 1 nationwide U.S. wireless carriers currently owns. Also included in this list is Dish Network, which for the past several years has been quietly accumulating a war chest of spectrum that today almost rivals that of T-Mobile. These maps and charts include all pending spectrum transactions filed before April 30, 2017 (the FCC reviews all license spectrum transactions). Importantly, these maps and charts also include the results of the FCC’s recently completed incentive auction of TV broadcasters’ unwanted 600 MHz licenses. For complete details on the results of that auction, click here. 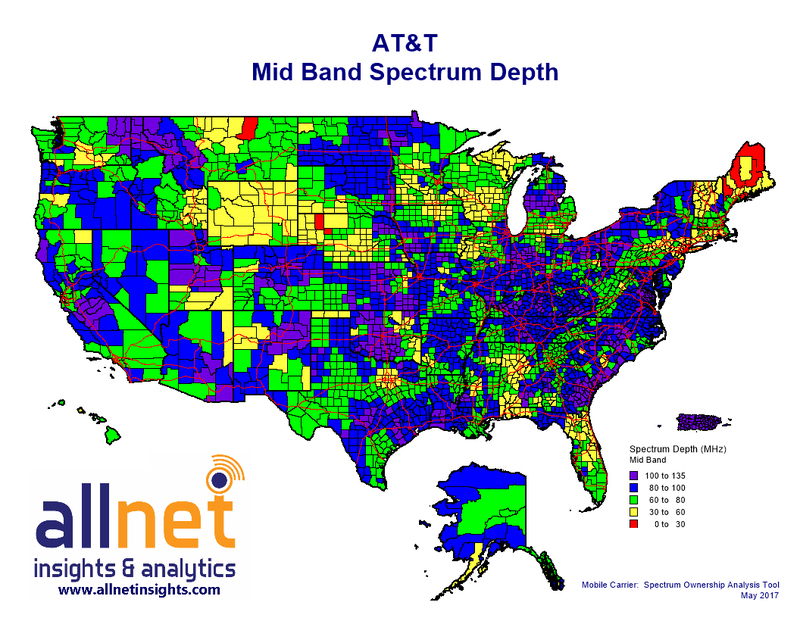 Allnet Insights' data also includes the spectrum AT&T is getting access to through its partnership with FirstNet. 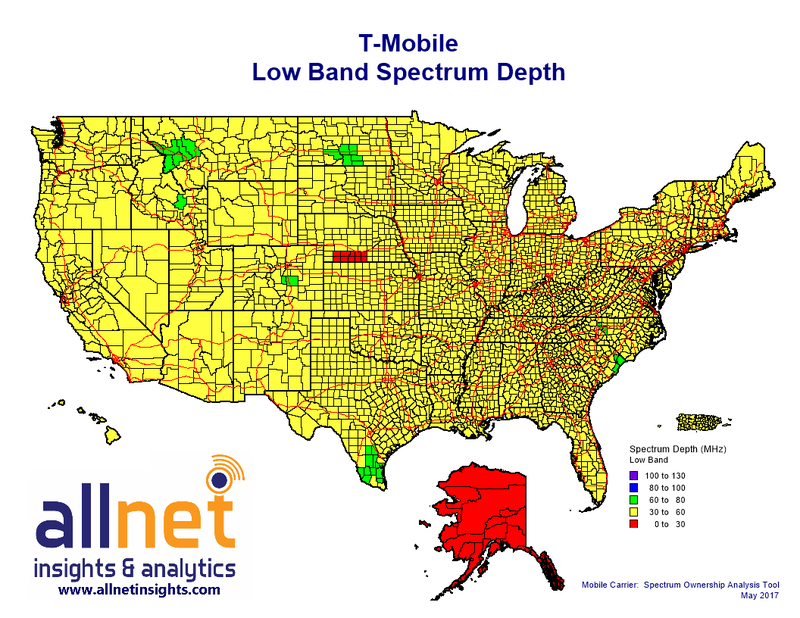 It’s important to note that each spectrum band has its own unique characteristics. For example, low-band spectrum is ideal for covering large geographic areas and penetrating buildings. High-band spectrum, on the other hand, typically doesn’t transmit as far as low-band spectrum but is generally able to carry more data at faster speeds. This chart shows the average spectrum held by the top five spectrum holders in the United States. 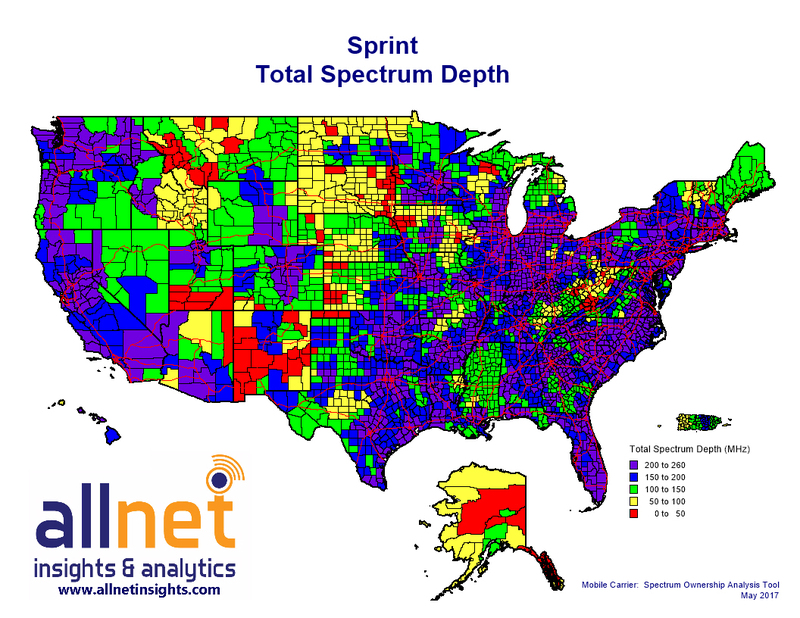 It’s a way to quickly visualize how much spectrum each carrier typically has in markets across the country. 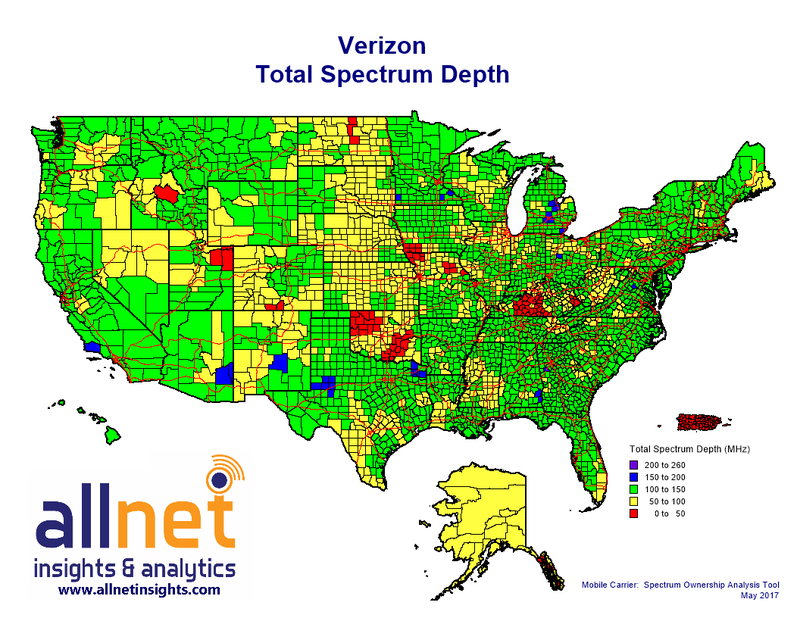 This chart breaks down the spectrum held by the top five spectrum holders in the United States further, showing how much spectrum each holds in the nation’s top five largest markets. 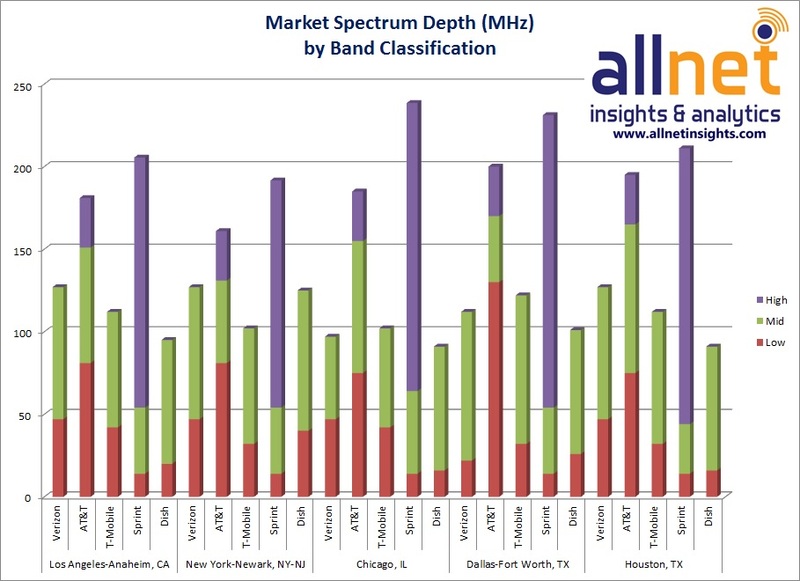 Allnet notes that, in Dallas, Verizon's low band spectrum holdings are much lower than the other top five markets because AT&T owns both of the cellular licenses in this market. 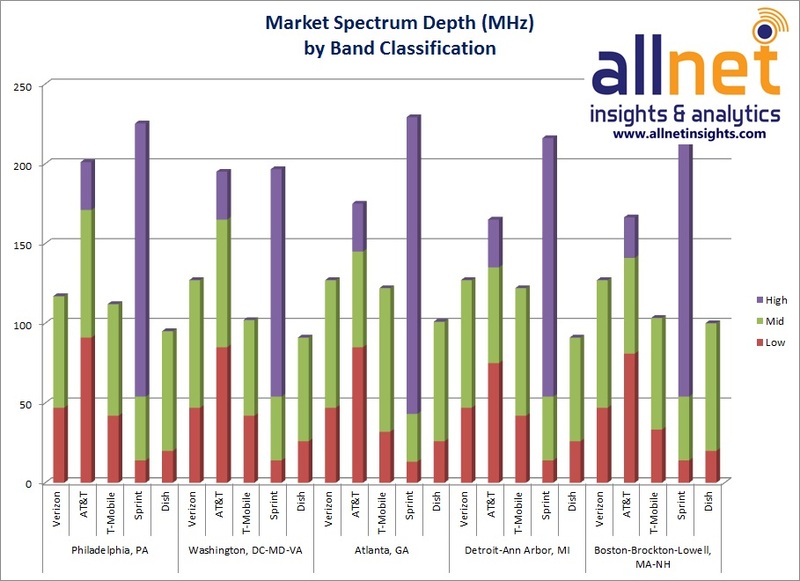 This chart breaks down the spectrum held by the top five spectrum holders in the United States further, showing how much spectrum each holds in the nation’s top 6-10 largest markets. However, to be clear, these maps do not include spectrum in the millimeter-wave range, which is generally spectrum above 28 GHz. 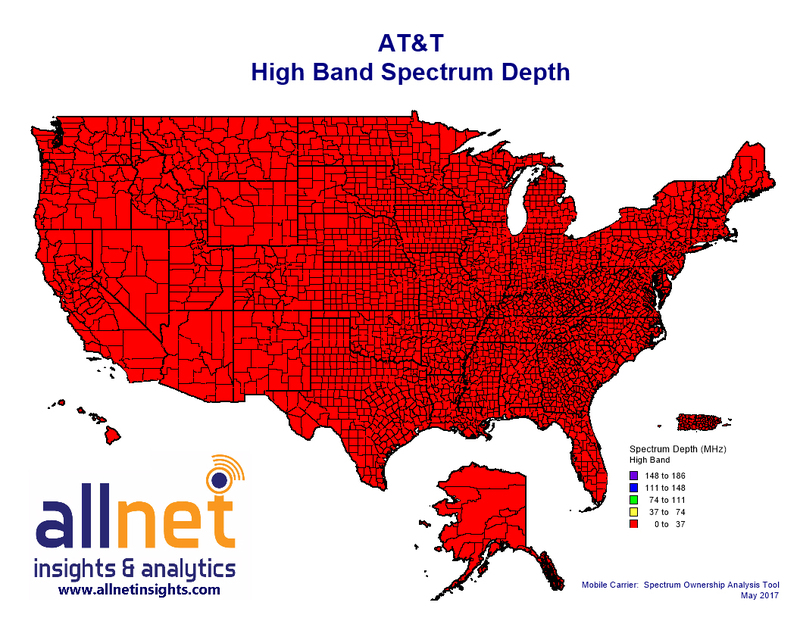 If AT&T closes its purchase of FiberTower and Verizon closes its purchase of Straight Path, the two carriers stand to own the bulk of the nation’s available, licensed millimeter-wave spectrum. 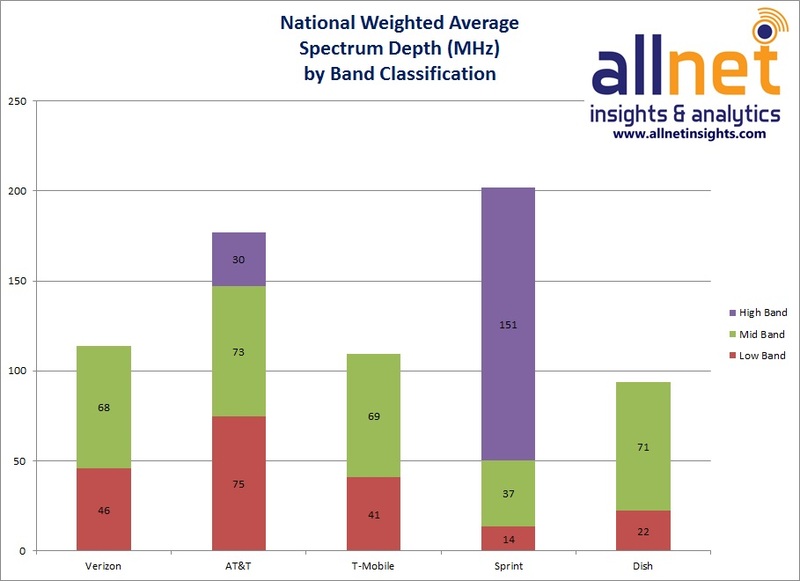 Indeed, Allnet Insights & Analytics noted AT&T would own roughly 136 MHz of millimeter wave spectrum with FiberTower’s active licenses (or over 450 MHz of millimeter wave spectrum if all of FiberTower’s terminated licenses are restored) and Verizon stands to gain over 1200 MHz of millimeter-wave spectrum. Both carriers have said such spectrum will underpin their planned 5G networks. 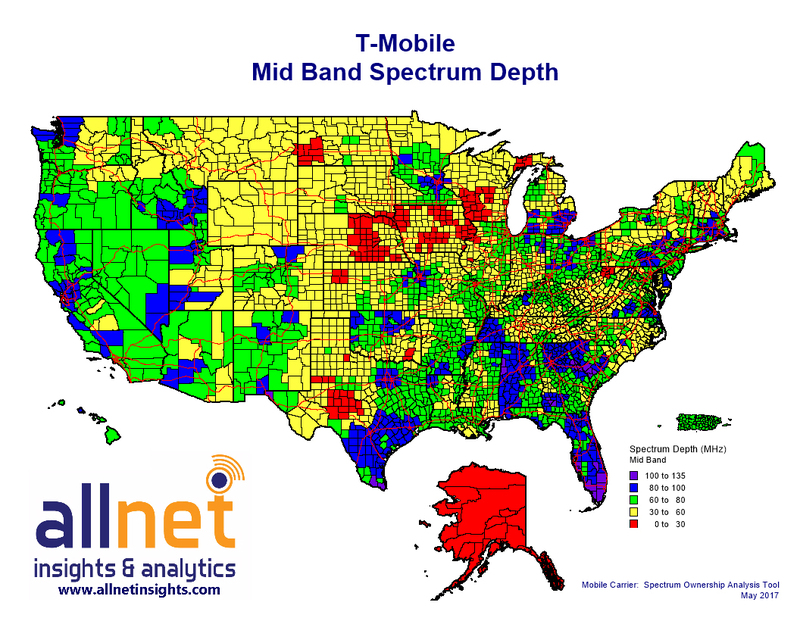 Now that we’ve taken a look at spectrum ownership on a nationwide average, and in the nation’s top 10 largest markets, it’s time to get a detailed look at the total amount of high-, mid- and low-band spectrum each carrier owns across the United States. Scroll down for maps for Verizon, AT&T, Sprint, T-Mobile and Dish. Verizon is the nation’s largest wireless carrier with around 146 million customers at the end of the first quarter. The operator’s LTE network covers roughly 314 million POPs. 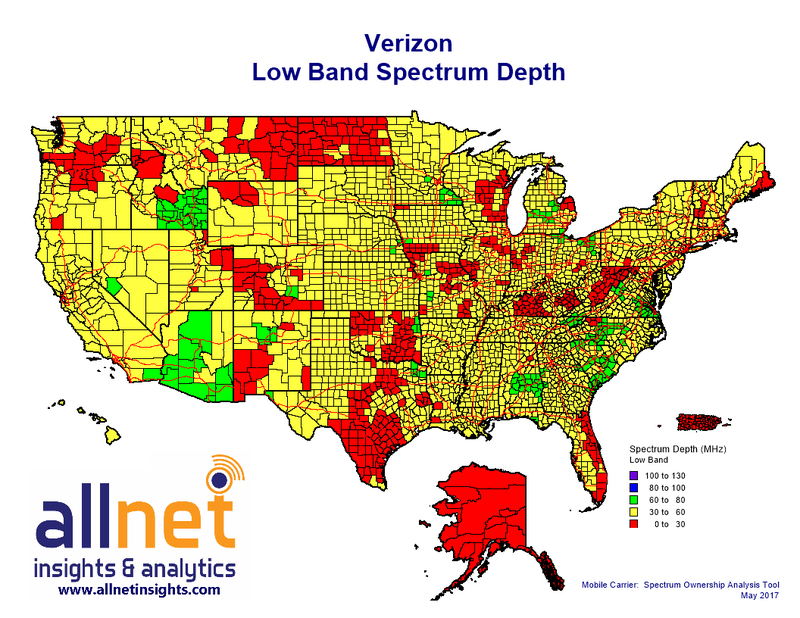 Verizon initially built its LTE network on the 700 MHz spectrum licenses it won in the FCC’s 700 MHz spectrum auction during 2008. It has since bolstered those spectrum holdings via acquisitions of other licenses including AWS-1 spectrum licenses as well as spending roughly $10.4 billion in 2015 on AWS-3 spectrum licenses. However, Verizon did not win any 600 MHz licenses in the FCC’s recent incentive auction. AT&T is the nation’s second largest carrier with around 134 million customers. The operator’s LTE network covers 400 million people in North America, an area that includes AT&T’s new operations in Mexico. The operator’s LTE network primarily works on its AWS-1 and 700 MHz spectrum licenses, but can also stretch into its WCS holdings and other spectrum bands. AT&T spent around $18 billion on AWS-3 spectrum licenses in 2015. The carrier also spent less than $1 billion during the incentive auction to pick up spectrum in 18 PEAs, grabbing 30 MHz in Dallas and lesser amounts in smaller cities. This data also includes the spectrum AT&T is getting access to through its partnership with FirstNet. T-Mobile is the nation’s third-largest wireless carrier with around 72 million customers. The carrier’s LTE network covers 314 million people, on the way to 321 million people by the end of the year. T-Mobile’s LTE network primarily works on its AWS-1 licenses and its growing trove of 700 MHz licenses. Sprint is the nation’s fourth largest wireless carrier with around 58 million customers. The operator’s LTE network covers around 300 million people. 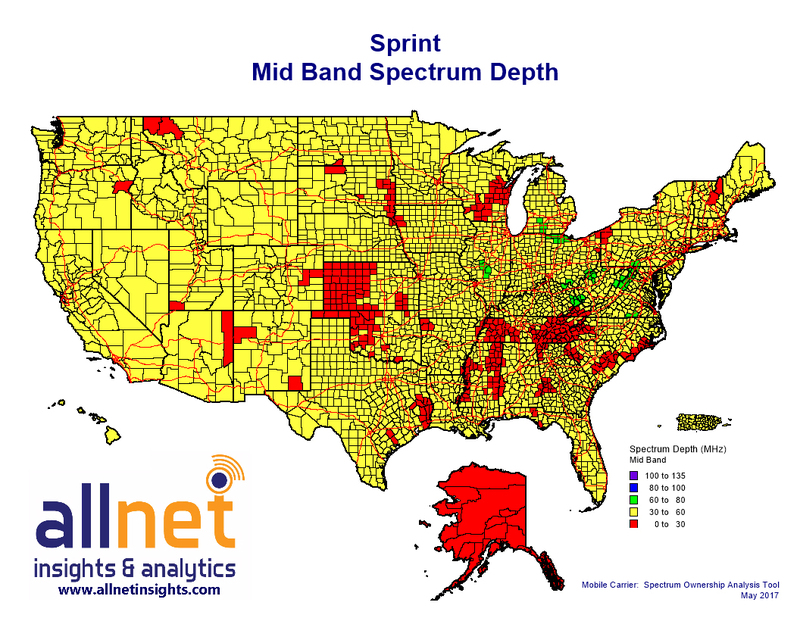 Sprint’s network primarily relies on the carrier’s 800 MHz, 1900 MHz and 2.5 GHz spectrum holdings. The carrier has not participated in any recent spectrum auctions. 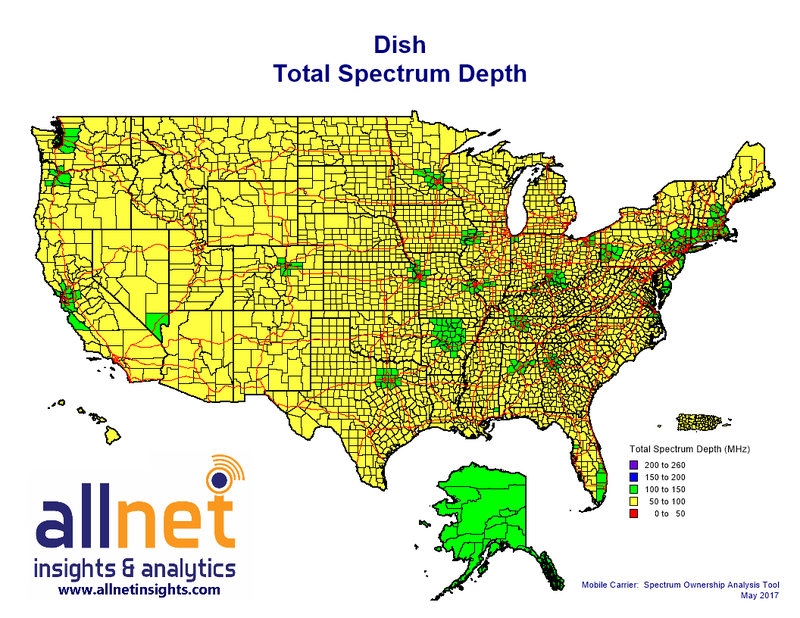 Dish has quietly worked to cobble together a significant amount of spectrum via spectrum auctions and secondary-market transactions. The company’s first spectrum purchase was made through EchoStar's relatively minor purchase of E Block licenses for $700 million in the FCC's 700 MHz spectrum auction in 2008. But Dish in 2011 spent $2.77 billion to acquire 40 MHz of S-band satellite spectrum from bankrupt TerreStar and DBSD North America. Then, in 2014, Dish was the only bidder in the FCC's H Block spectrum auction, essentially walking away uncontested with 10 MHz for around $1.6 billion. In 2015, Dish spent roughly $8 billion on AWS-3 spectrum licenses, and then just two years later it committed a whopping $6.2 billion to buy 486 licenses in the FCC’s 600 MHz incentive auction. Dish recently outlined plans to build an NB-IoT network using its spectrum to provide connectivity to a wide range of devices other than traditional tablets and smartphones. Some analysts remain skeptical, though, believing that Dish plans to either sell or lease its spectrum, or partner with an existing service provider to join the wireless market.